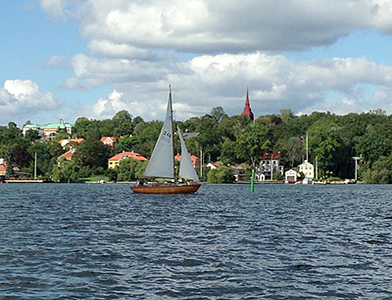 Stockholm - a capital city on the water. My wife might have been thinking of a restaurant for dinner when she asked "Where would you like to go for your birthday?" but I answered: "Stockholm." 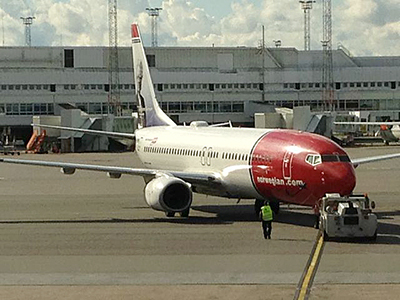 Being game for great travel adventures, she said "Fine" and we booked flights on Norwegian Air's new Dreamliner to spend five August days in the Swedish capital, one of Europe's most beautiful port cities. 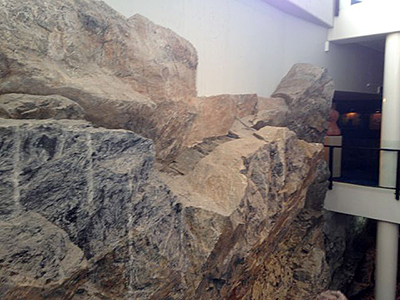 We chose the week carefully so that we'd be there for a very special concert at Stockholm's Berwaldhallen, a modern concert hall built into the side of a solid rock hill in order to avoid looking too big in a neighborhood of fairly low rise apartments and old mansions now used as embassies. 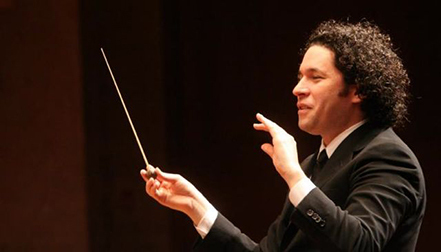 The concert featured Gustavo Dudamel, the young (33 year old) Venezuelan conductor who has had an all-but-meteoric rise from his native country's famed El Sistema youth music program. He is now music director of not only Venezuela's Orquesta Sinfónica Simón Bolívar, but the Los Angeles Philharmonic as well. Dudamel led Swedish youth from its own El Sistema program and then conducted Sweden's Gothenburg Symphony Orchestra of which he was the principal conductor from 2007 to 2012. 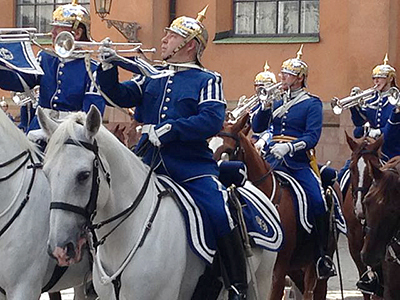 They preformed Jean Sibelius' Second Symphony. 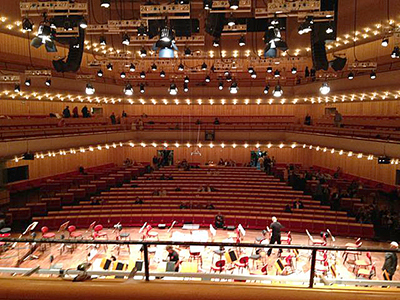 The children who performed before intermission were obviously thrilled to have their hero in their midst, and the professionals of the Gothenburg Symphony responded to his leadership with a sweeping performance of the oh-so-Nordic sounds of Sibelius. 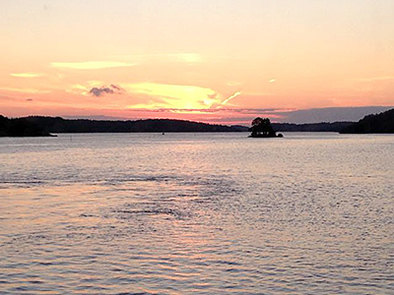 As thrilling as the Sibelius was, there was much more than classical music to sample in this lovely water-oriented city. 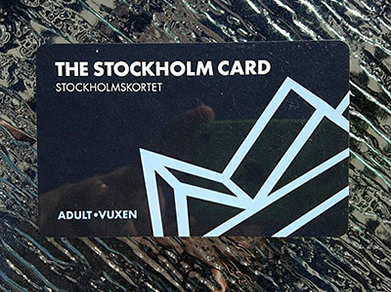 With a StockholmPass card (825 Krona/$100 for three days of unlimited rides on local mass transit and admission to many attractions) the entire city was available. We began with rides on the subway and tram into and around the city, but the best way to get oriented to this harbor city was a canal boat tour with views of the city from the water. 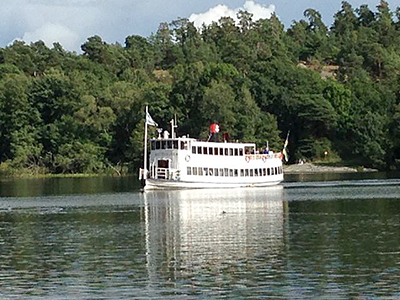 Two canal tours are free to holders of the StockholmPass. 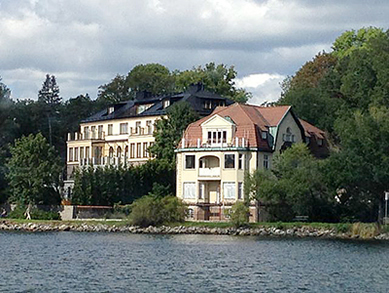 One, an "Historical Canal Tour,” covers the city hall and central canals. 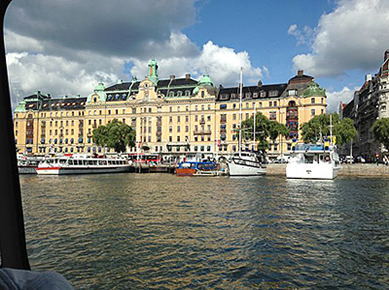 The other, the "Royal Canal Tour," concentrates on the abundance of open spaces including the huge Djurgarden island park that once was the royal animal reserve which was stocked with the king's reindeer. 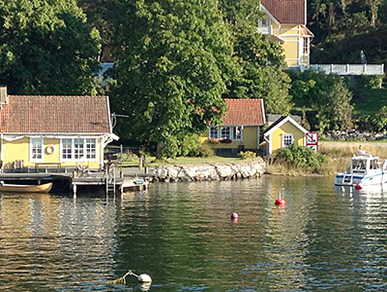 Part of that reserve is now Skansen, the oldest open-air museum in the world. Across the canal from from the parkland is a lovely residential area. 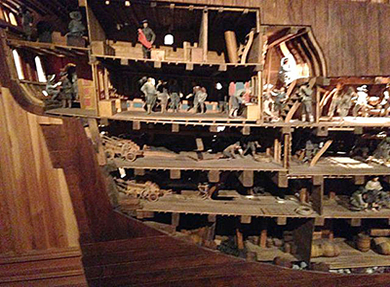 The Vasamuseet also has models showing what life in the interior was like. Not all tall ships are afloat on the open water. 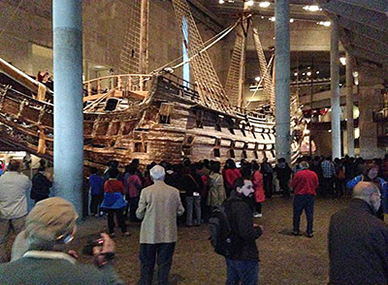 The Vasa, a 17th Century warship that capsized in the harbor less than 2,000 yards into its maiden voyage in 1628, has been raised and is now housed at one end of Djurgarden island inside Stockholm's most popular museum, the Vasamuseet. It is huge - more than 200 feet long and over 60 feet high from the keel to the top of the stern. 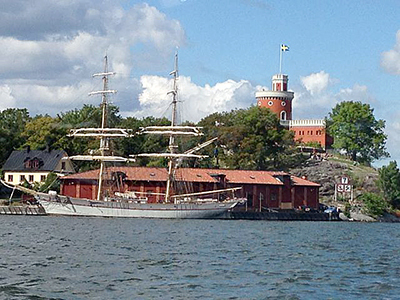 The Vasamuseet is but one attraction on Djurgarden. 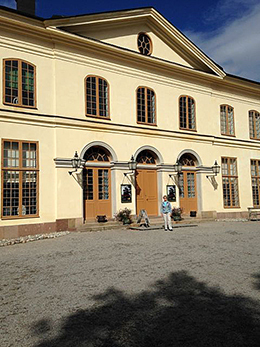 Also on the island is the castle-like Nordiska Museet, devoted to all things Norse. 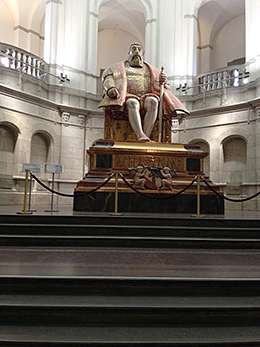 Its great hall is dominated by a huge statue of Sweden's founder-king, Gustav Vasa for whom that ill-fated warship was named. These museums share the western end of the island and sport the former royal hunting ground with its blue-painted main gate. 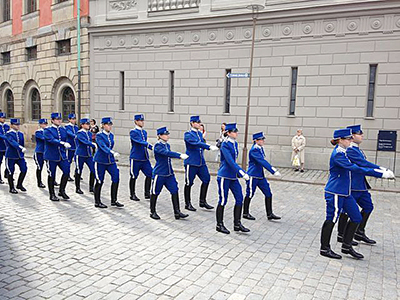 Since Stockholm is the capital of Sweden, a visit must include the changing of the guard at the Royal Palace. While there are many downtown attractions, there are also excursions outside of the city that should not be missed. 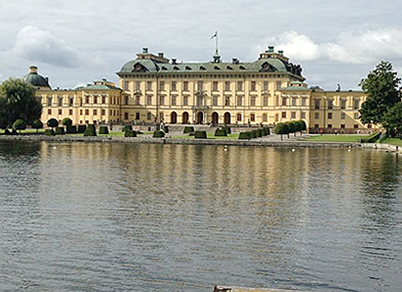 A day-trip to the Swedish Royal Family's Residence at Drottningholm involves more travel by water to the palace on an island in Lake Malaren east of the city. The cruise takes about an hour, but what a lovely hour! 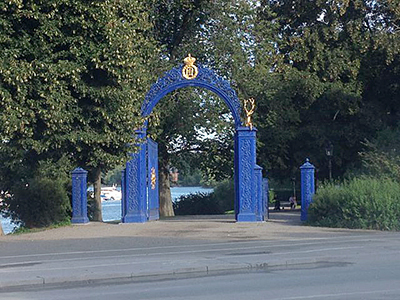 From the water as you approach, Drottningholm Palace on the island of Lovon looks pretty much as it did at the end of the 17th century. The outbuildings include the famous Slotttsteater which dates from 1766 and seems today inside and out just as it did then. 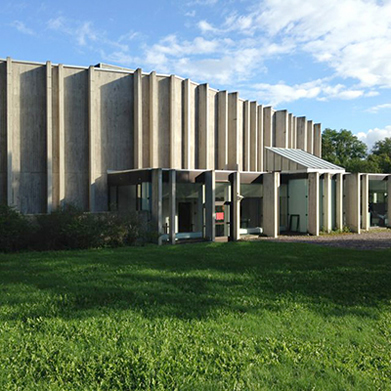 It still is the site of an annual opera festival of note. 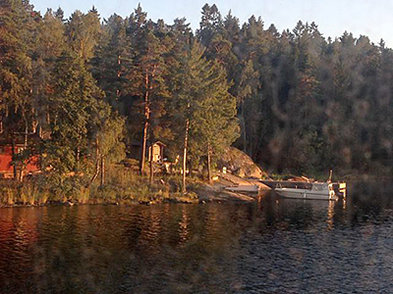 While an hour cruise to the east onto Lake Malaren was fun, a longer voyage to the west was a thrill. 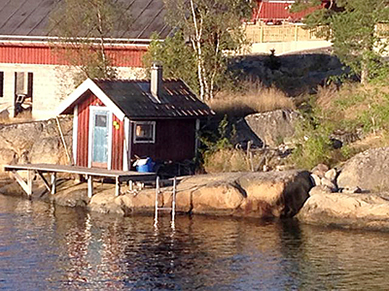 Stockholm is located at the most protected spot of an archipelago of more than 24,000 islands scattered over the 50 miles between Stockholm and the Baltic Sea. 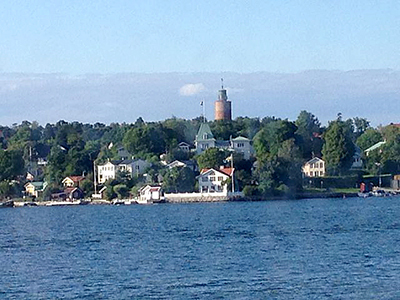 The Stockholm Regional County Council operates a public transportation system of two-dozen vessels that transit between 300 spots ranging from small towns to tiny jetties. 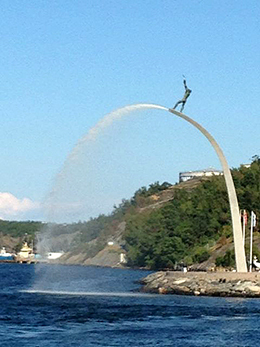 On an early dinner cruise out of Stockholm, we passed Carl Milles' scupture of a joyous youth atop an arch that turned into a spraying fountain. It's called Gud pa Himmelsbagen. In the right light it is a rainbow. 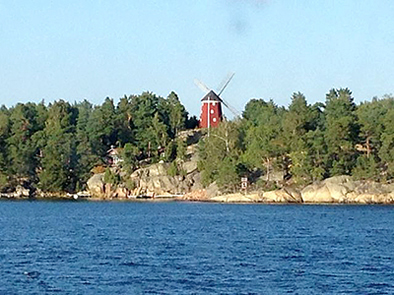 The journey continued out past waterside communities and isolated homes with their sauna huts and even a windmill or two. But mostly, it is the views across the waters that remain in the mind. So, what did I get for my birthday dinner? 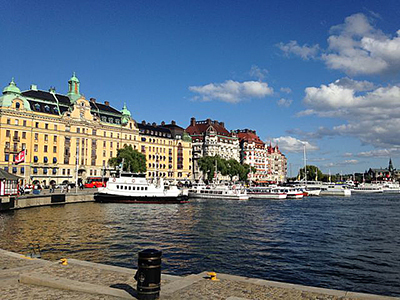 A real taste of Stockholm - a gorgeous capital on the water. 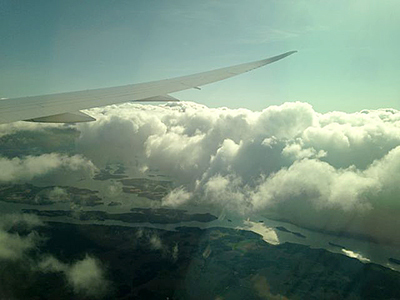 On our return flight, I watched Sweden (and then Norway) receding underneath the distinctively up-swept wing of the Dreamliner. Brad Hathaway retired from full-time work as a theater reviewer for multiple websites and feature writer for Show Music, American Theatre, Live Design and Stage Directions magazines and now writes about theatre and other things from the houseboat he shares with his wife in Sausalito, Calif.